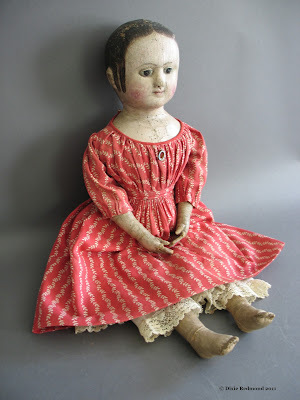 A couple of years ago there was a discussion on the Yahoo Vintage Cloth Dollmaking group about museums and shops to visit dealing in antique dolls. One of the members from Maine mentioned they had gone down to Lucy's Doll House in Camden, Maine. I decided to go down, and brought my camera along, just in case. I went in, looked around and at the doll and talked with the owners saying, "I represent a group that studies old dolls and was, um, wondering, um, if I could take pictures of the Izannah Walker doll you have?" Said doll was in a glass case all locked up. But the owners are so gracious and allowed me to take a few pictures of this Izannah, which had recently been purchased at the Skinner auction. They took her outside where the light was really nice and sat her on a nice cart, draping her clothing underneath. I remember my hands were actually trembling because I saw the price tag on the doll. I took a few shots, trying to get good angles that dollmakers would appreciate. Later in the year, a friend traveled down with me again to Camden. We visited the Izannah doll above, and then we went to lunch with the plan to go back and look again. All during the lunch I barely focused on my food and talked about how I would really love to be able to take pictures ofthe doll without clothes to see how she's constructed. I said to my friend, "It's said, "You have not because you ask not." So I determined that I would go back to the shop and ask if I could take pictures of the doll's construction. I was really, really nervous about asking. Well, it did work out that I could take pictures of her construction details (Thank you, Sue!) If you click on the picture of this doll in the right sidebar you will see an album of detailed pictures of her. Here's what I've learned from that experience. Sometimes something that you dream of is only a question away. And what if I had given into my fear that NO would be the answer? I wouldn't have been able to take those pictures. Other than family highlights, that has been one of the funnest moments of my life. My deepest heart-felt THANKS to those wonderful souls at "Lucy's Doll House" for granting your request. 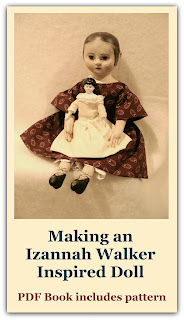 In doing so they have given a great gift to so many doll lovers and makers.